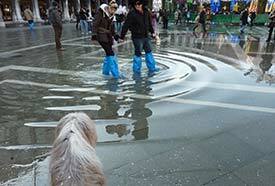 ABOVE: A dog watches a wading couple at the Piazza San Marco during acqua alta. Can you give me an overview of Venice? See: Introducing Venice, Italy and our Venice Orientation Map. Why is Venice a city of canals? About 1,500 years ago, residents of the mainland fled to islands in the Venetian Lagoon to escape barbarian invaders. Over time, they built a city on 118 of the islands, and the gaps between the islands became canals. Bridges were added later. Possibly, but not by much. The real problem is that sea levels are rising. Fortunately, Venice is unlikely to become a modern-day Atlantis before your visit. Do I have to worry about flooding? Only if you're on a tight schedule and can't stay high and dry until the tide recedes. Venice's flooding, or acqua alta, occurs when a combination of an unusually high tide, low atmospheric pressure, and southerly winds forces an abnormal quantity of water into the Venetian Lagoon from the Adriatic Sea. (This happens most often from fall through early spring.) The water has nowhere to go, so it covers the pavement in low-lying areas of the city for a few hours. You're most likely to encounter acqua alta in the San Marco area, where it isn't uncommon to see water oozing up through the drains in St. Mark's Square at high tide. Some do, but many don't. (They're too busy juggling Italian and Venetian dialect.) People who work in the tourist trade generally speak enough English to communicate with visitors. If you can manage a few critical Italian phrases like "Per favore," "Grazie," and "Dov'è la toilette? ", you'll do fine. You just mentioned toilets. Are they easy to find? Can I use my cellular phone or tablet in Venice? Yes, if it's a GSM device that's compatible with European frequencies, and if you've enabled roaming. But be careful if you're visiting from overseas, because international roaming fees can be horrendous. Yes, but only in private quarters, and only if permitted by your hotel or landlord. In restaurants, bars, and other public areas, indoor smoking is illegal--and even Italians, who aren't noted for respecting authority, obey the rules.